29 Commercial Real Estate & Properties in St Peters are listed in 4 categories. We have 15 OfficesSale & Lease , 10 Industrial Warehouses Sale & Lease , 3 Retail ShopsSale & Lease and 1 Development LandsSale & Lease . Suite 7.04 is a fantastic ground floor suite with heaps of exposure through a main thoroughfare at Precinct 75. This great suite in it's prime location makes an ideal retail space or showroom for any business looking to interact with the community. Precinct 75 is a community of creative business, and the neighbours are great........Sample Coffee is serving great coffee, The Rice Pantry Vietnamese taste sensations and Willie the Boatman microbrewery for an ale at the end of the week!! High speed internet is immediately available, there is free on site parking and Sydenham train station is only a 6 minute walk away. For any more information or if you would like to inspect this property, feel free to give Deans Property a call today! Great Ground Floor Entry Level Space $390 (Per week. Gross + G..
Prime Showroom / Studio / Workshop $1,900 (Per week. Gross +..
Budget Priced Creative Space walk to train station. Fully refurbished to provide: Brand new toilets + shower Kitchenette Brand new air conditioning system Very light and bright light on three sides. Shared garbage room. This is great space in an excellent location available at a budget rental. Light filled first floor office / studio space in the prime central location at Precinct 75, has access from both sides and makes a statement to anyone who visits. High ceilings, air conditioning, meeting room, internal kitchenette and heritage features, the possibilities in this inspiring space are endless! Precinct 75 has it all......Sample Coffee Roasters serving great coffee, cupcakes at Buttercream Bakery and Willie the Boatman microbrewery Tasting Room! There is on site parking and Sydenham train station is only a 6 minute walk away. For any more information or if you would like to inspect this property, feel free to give Deans Property a call today! :: Creative studio :: funky :: warehouse :: artistic :: storage :: recreational This adaptive space has been renovated to the highest 'industrial' standards. Located in a large mixed use estate surrounded by quality furniture designers/manufacturers, event management, project management, on site cafe, recreational users such as Indoor Climbing Gym, Flying Trapeze School, Martial Arts School, Dance & Yoga Schools and light industrial uses. This space is perfect for many uses such as designer studios, creative offices, recreation, wine storage, artist studio, clothing, light industrial etc. Internal clearance of 2.4m. Great loading and onsite parking right at your door. Long term lease available. May be combined with adjoining unit to add an additional 238sqm if required. :: Creative studio :: funky :: warehouse :: artistic :: storage :: recreational This adaptive space has been renovated to the highest 'industrial' standards. Located in a large mixed use estate surrounded by quality furniture designers/manufacturers, event management, project management, on site cafe, recreational users such as Indoor Climbing Gym, Flying Trapeze School, Martial Arts School, Dance & Yoga Schools and light industrial uses. This space is perfect for many uses such as designer studios, creative offices, recreation, wine storage, artist studio, clothing, light industrial etc. Internal clearance of 2.4m. Great loading and onsite parking right at your door. Long term lease available. Gunning Real Estate is pleased to present this 2 handy warehouses for lease. Strategically located within close distance to the City and Port Botany, the warehouses would suit a variety of usage. The 2 warehouses can be leased separately or together. Warehouse 1 400sqm approx. High clearance Mezzanine office Cool room at rear Rear door access from common yard 3 phase power Male&female toilets Warehouse 2 (From the 6th photo onward) 390sqm approx. 4 cool rooms Grease trap + exhaust + gas in place 1st floor office 3 phase power Male&female toilets Please contact William Wu (0450 250 123) for further information and inspection. Will Be Sold- Eoi -offers By 2nd September 2018 POA Ring Mark Furneaux 04.. The property is prominently located on the corner of the Princes Highway and Grove Street, St Peters. This location is close to the BP Service Station and approx 100 metres south of the major intersection with Canal Road. Hidden Gem! Office , Showroom, Warehouse with own private yard and excellent street parking Huge potential to use this unique building for a variety of commercial , showroom , creative, industrial uses and residential uses subject to council approval. Features include: Huge exposure to passing traffic on the Princes Highway approx 67,000 vehicles a day. 2 Seperate freehold titles being sold in one line. 3 street frontages Feature front office , showroom section with open plan and 25 feature skylights. Rear area currently used as a warehouse but could easily be used for multiple uses. B6 Zoning Allows a wide variety of Business, Office, Retail and Light Industrial Uses (stca). Residential Uses are permitted under the zoning as part of a mixed development ( stca) Kitchenette 2 W.C's + Shower 2 Electric Roller Doors Rear building column free with internal clearance of 4.1 to 4.86 metres high. Whilst the property has a large hardstand which is ideal for parking, Grove Street also has excellent all day and short term street parking available. Whilst current improvements total approx 433 sqm there is the potential to add a further 255 sqm of accommodation which could most easily be added as a second story to the rear building, subject to council approval. This is a great opportunity to purchase an existing facility which can be remodelled to provide quality office, showroom and storage space with the potential of residential uses subject to council approval. The property is approximately 1km from Sydenham train station and bus access via the Princes Highway. An inspection is highly recommended to fully appreciate this property. :: Creative studio :: funky :: warehouse :: artistic :: storage :: recreational This adaptive space has been renovated to the highest 'industrial' standards. Located in a large mixed use estate surrounded by quality furniture designers/manufacturers, event management, project management, on site cafe, recreational users such as Indoor Climbing Gym, Flying Trapeze School, Martial Arts School, Dance & Yoga Schools and light industrial uses. 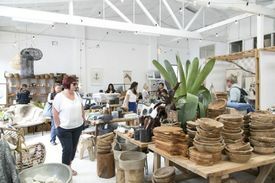 This space is perfect for many uses such as designer studios, creative offices, recreation, wine storage, artist studio, clothing, light industrial etc. Internal clearance of 2.4m. Great loading and onsite parking right at your door. Long term lease available. 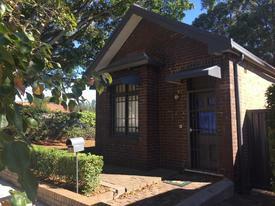 May be combined with the adjoining 285sqm space to create a larger 523sqm premises. Character threee bedroom cottage on industrial estate with street frontage, great natural light, living room, dining, kitchen, bathroom and yard. Three reserved car spaces. The property is located on the western side of Hutchinson Street close to its intersection with Appleby Street. The property is in a popular precinct being close to Newtown and St Peters Station (approx 350 sqm) ,parks Sydney Park, Camdenville Park and Simpson park. Also a short walk to Velvet Garage Cafe and Copper Cafe. Modern 62 sqm suite 350 sqm to St Peters station close to cafe and parks. The space is located on the ground floor in a corner position of the new Rinato development. Very light and bright, and has its own WC and kitchenette. High ceiling up to 4.8 metres huge windows. Space also includes a secure car park and storage area . Suite also has access to private communal garden area located inside complex. Permitted uses are creative type uses including media,advertising,fine arts and craft, design, film and television, music, publishing, performing arts, cultural heritage institutions or other related purposes. :: High Clearance :: Excellent Access :: Short Term 342sqm of high clearance industrial space available for short term lease. This space has excellent access and available on a monthly licence. The property is located on the western side of Hutchinson Street close to its intersection with Appleby Street. The property is in a popular precinct being close to Newtown and St Peters Station (approx 350 sqm) ,parks Sydney Park, Camdenville Park and Simpson park. Also a short walk to Velvet Garage Cafe and Copper Cafe. NOW AVAILABLE FOR OCCUPATION. 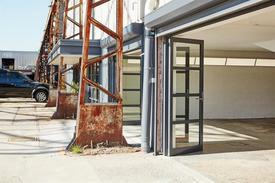 Brand new creative workspaces 350 sqm to St Peters station close to cafe and parks. The space is located on the ground floor in a corner position of the new Rinato development. Very light and bright, and has its own WC and kitchenette. Studio 3 has high ceiling up to 4.8 metres huge windows. Areas available are as follows: Studio 1 40 sqm $18,700 pa gross plus GST Studio 3 62 sqm $24,800 pa gross plus GST Please note both units have a secure car park and storage area included in the rental. Permitted uses are creative type uses including media,advertising,fine arts and craft, design, film and television, music, publishing, performing arts, cultural heritage institutions or other related purposes. :: Creative studio :: warehouse :: funky :: artistic :: storage :: recreational This space has been renovated to the highest 'industrial' standards. Located in a large mixed use estate surrounded by recreational users such as Indoor Climbing Gym, Flying Trapeze School, Martial Arts School, Dance Schools and light industrial uses. This space is perfect for many uses such as creative office, sound recording, recreation, wine storage, artist studio, clothing warehouse, light industrial, fabric cutting etc. Internal clearance of 2.4m. Ample onsite parking. Inspection recommended. 2 Brand New Creative Office Suites - 40and 62 Sqm From $18,700 pa gross plu..
:: High Profile :: Showroom Space :: Art Deco Style :: Huge Exposure :: Flexible Sizes This amazing Art Deco Showroom space has become available for the first time in over 15 years and offers an incredible opportunity to create an ideal Retail Showroom, Food Premises, Head Office or High Profile Industrial Space (STCA). This unique premises can be configured in a number of ways to offer flexible sizes and access points to suit your business. Depending on how the space is set up, the available premises can be 310 1200sqm with potential for more space if required. With incredible signage opportunities and access to the future West Connex Motorway, the opportunities are limitess. This opportunity really needs to be inspected to appreciate it's true potential. :: Creative studio :: funky :: warehouse :: artistic :: storage :: recreational This adaptive space has been renovated to the highest 'industrial' standards. Located in a large mixed use estate surrounded by quality furniture designers/manufacturers, event management, on site cafe, recreational users such as Indoor Climbing Gym, Flying Trapeze School, Martial Arts School, Dance & Yoga Schools and light industrial uses. This space is perfect for many uses such as designer studios, creative offices, recreation, wine storage, artist studio, clothing, light industrial etc. Internal clearance of 2.4m. Great loading and onsite parking right at your door. Long term lease available.